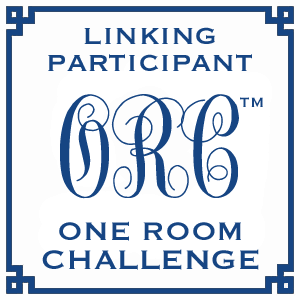 Welcome back to week 4 of the Calling it Home One Room Challenge. 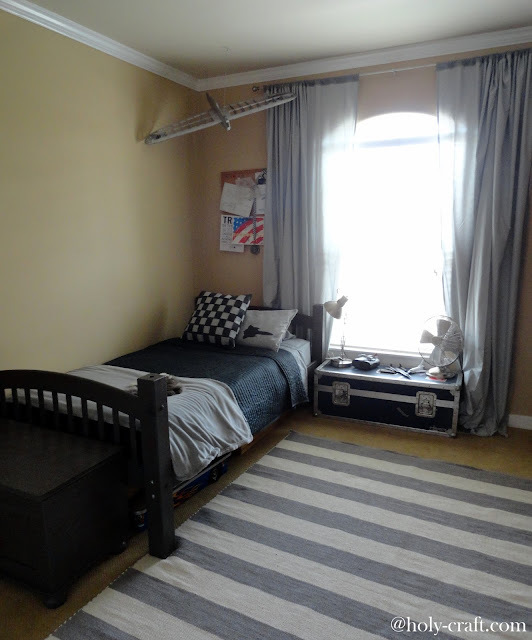 For the past 4 weeks I have been participating in this 6 week challenge to make over one room. 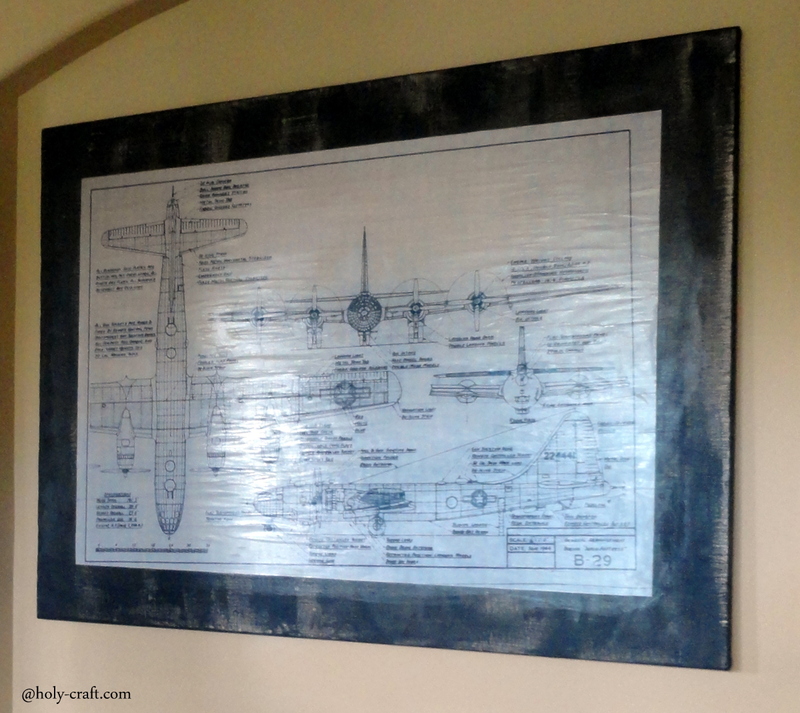 I have been working on my 8 year old son's vintage airplane room and this week, I focused on creating and collecting art work for Owen's room. I picked up this canvas for $3 at a garage sale. 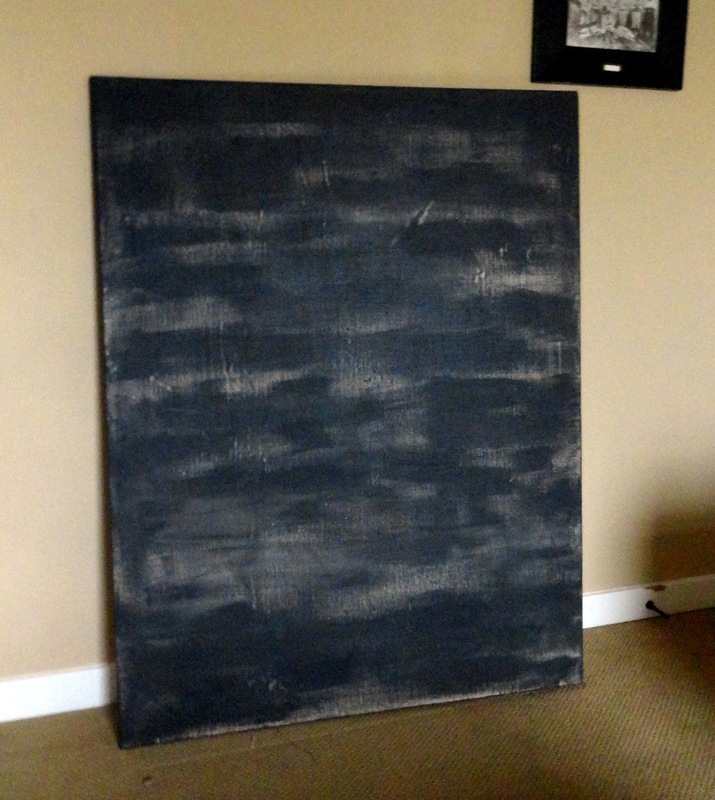 It was blank so I used this dark grey paint to dry brush over the plain canvas. 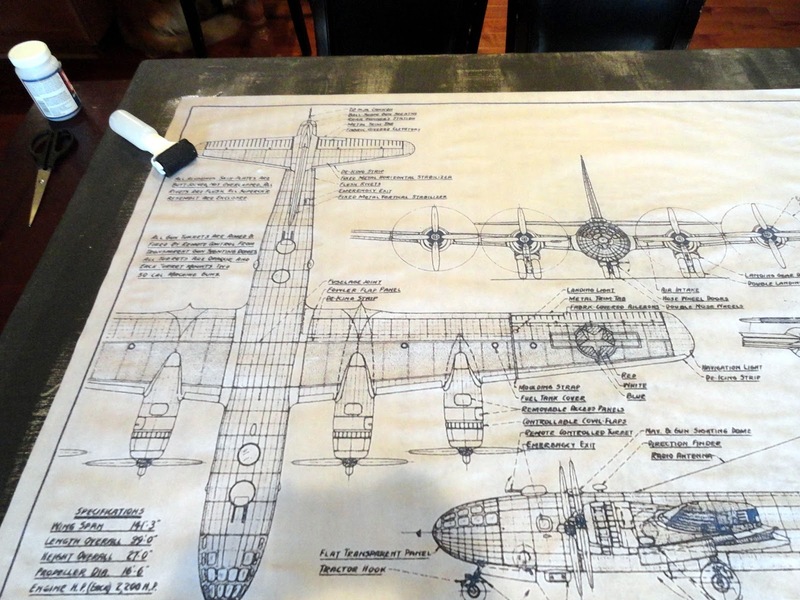 I found a free blueprint on line of a vintage airplane. 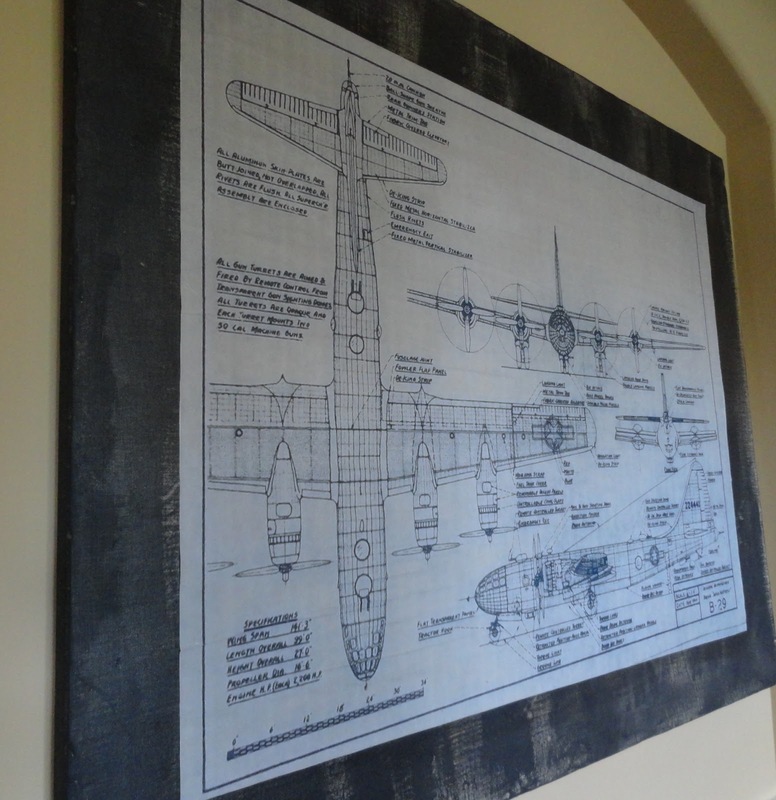 And not just any vintage airplane, a B-29, which is the same airplane that my husband's Grandfather flew on during WWII. I had it printed as large as I could. 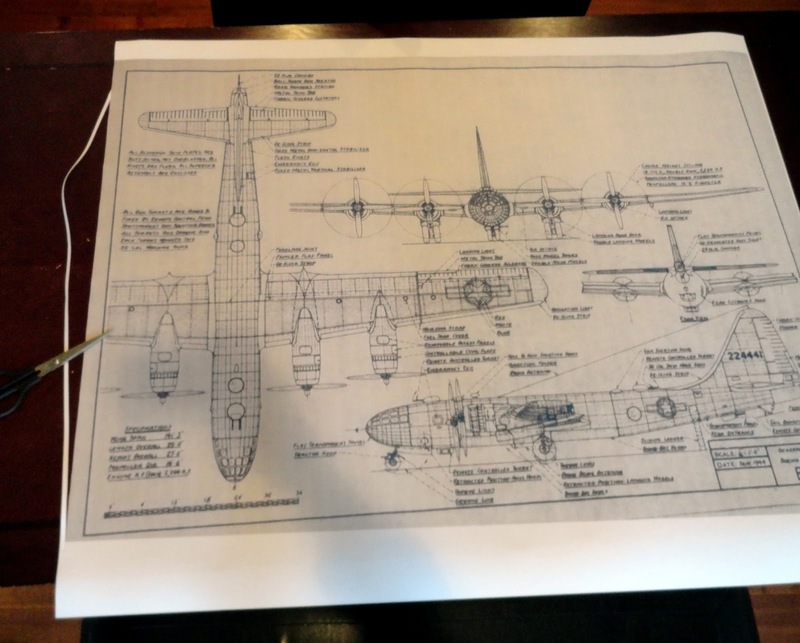 I have heard that you can get an engineer's print at your local copy store for under $5. I had an inside source who printed this off for me for free. Which, as you all know, is my favorite word! I did have to do a little grunt work and cut off the surrounding white edge. Once my print was cut and ready, I got out my supplies. I am lucky enough to have fancy Mod Podge supplies, but you could totally make this work with a simple brush that you have on hand. 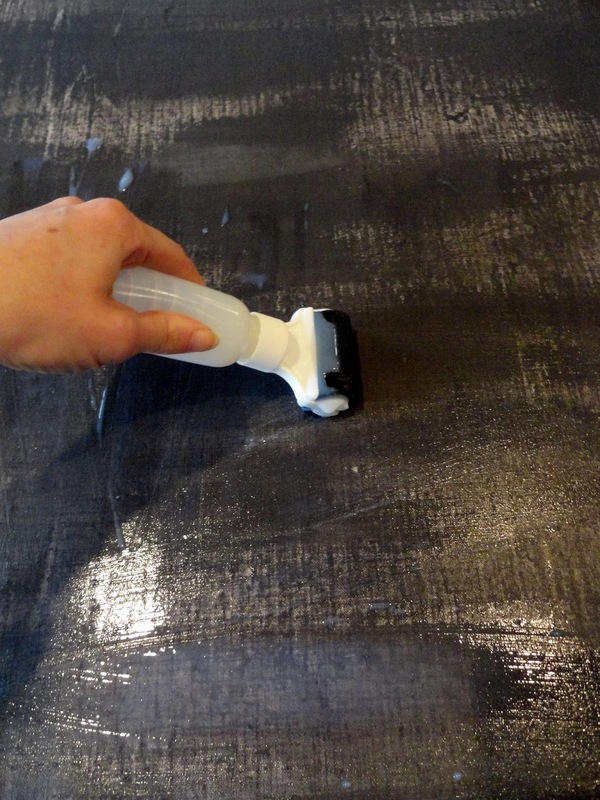 But I must say, this Mod Podge roller is pretty rad. And makes the job super easy! 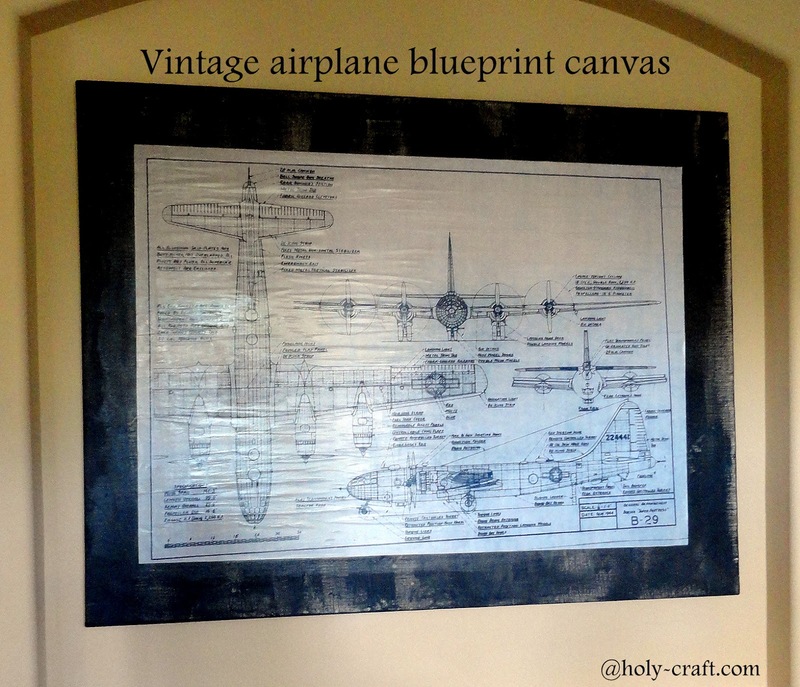 I started by rolling Mod Podge on to my canvas where my picture would eventually go. 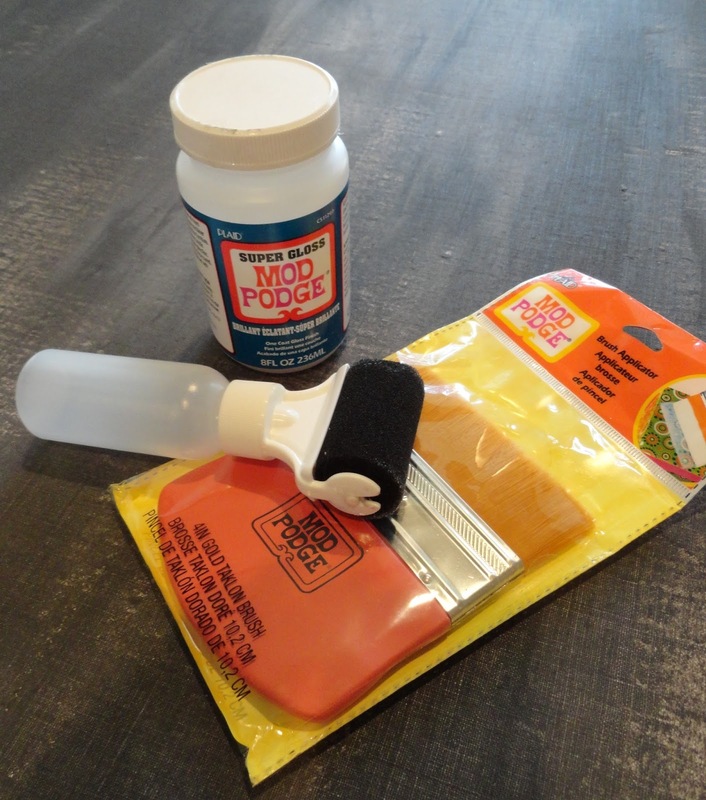 You want to make sure you roll your Mod Podge out smooth. Next, take your picture and position it on to your canvas. 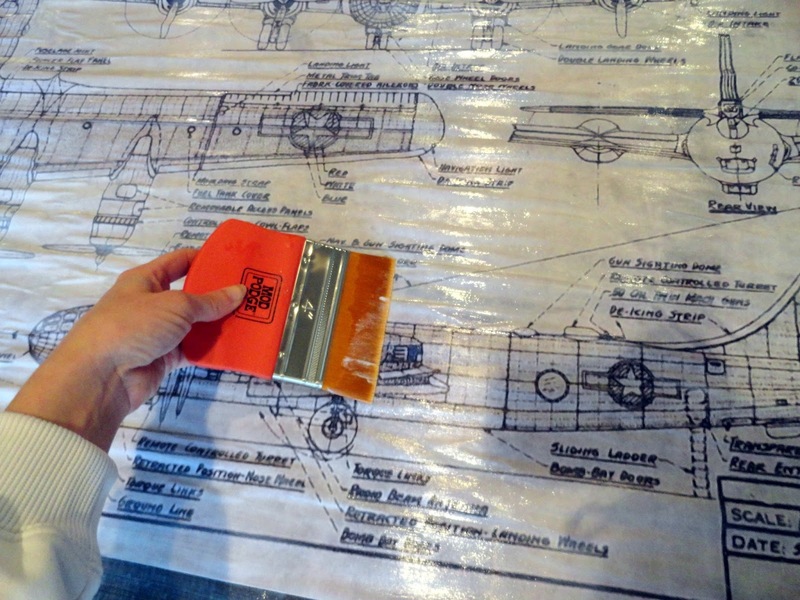 Because the blueprint was scanned in crooked, the angles were a little wonky, which made eyeballing it a little trickier than normal. I used a ruler to make sure the edges were all about the same distance from the edge. Once you have your image positioned, you will spread a layer of Mod Podge over the top of your picture. This step is not for the super perfectionist. You will not get a nice flat image even if you work from the center out. There are wrinkles and bubbles, but I liked the imperfect look for this project and rolled with it. I love the end result and can't wait to hang it in it's new permanent location. As a re-cap, here is how the past four weeks have broken down. Week 1 The Plan Week 2 Construction Week 3 Painted furniture, linens, curtains, and rug Next week, I'm hoping to have the artwork hung and start working on the finishing details for week six. How unique and wonderful is that artwork...well done!! That's a great piece of art that you've created and will have a big impact. I haven't had a ton of luck with Mod Podge - my pieces always came out bumpy. Is that always the case? Great job! I can't believe it was essentially free! I love modge podge too! This room will be awesome! 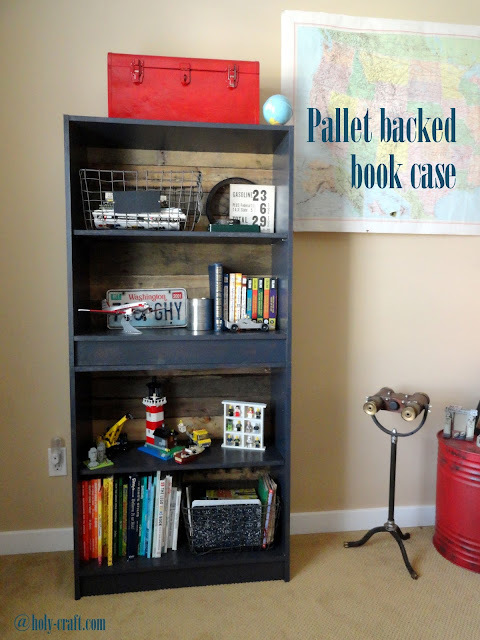 Such great artwork for a boy's room! The room is looking great! Love this art. Such a fun boy's room.